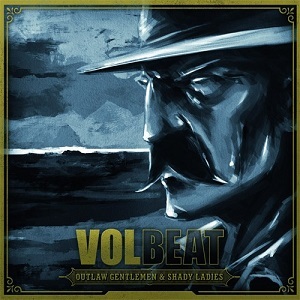 Danish band Volbeat are back with their fifth album. It's the first since former Anthrax guitarist Rob Caggiano joined the band, and is a release likely to divide fans. It's got quite a different sound to their earlier albums, so while many fans will love it, others are likely to hate it - band's can't win really as if they keep remaking the same album with a few changes then people criticise them for not changing and beng boring, but when they do try something new then they get criticised for that too. Personally I like to see bands trying new things - sometimes they work and sometimes they dont - either way they've tried and can bear feedback in mind for their next releases. A quick look at the track listing tells you the theme of the album - 'Doc Holliday', 'Lonesome rider', 'Black bart' and more - yes it's a Western themed album. 'Room 24' is a very heavy track with ROb Caggiano's influence showing through in those heavy guitars. The song features guest vocals from King Diamond. So, what to make of the album. I personally think it's a great album but as already mentioned I doubt if all Volbeat fans will be so enthusiastic at least initially - it's an album that is likely to take time for fans to get used to. I'd certainly recommend that people give it a listen though - it's definitely a great album.